Iron ore is the primary ingredient in steel production. Iron ore is flying high after a problem in Brazil. Trade issues with China could change the demand for steel. U.S. Steel looks awful - is it time to buy? There is an ongoing divergence between the price of iron ore and steel which is the result of production issues when it comes to the raw material and trade policy when it comes to the processed commodity. 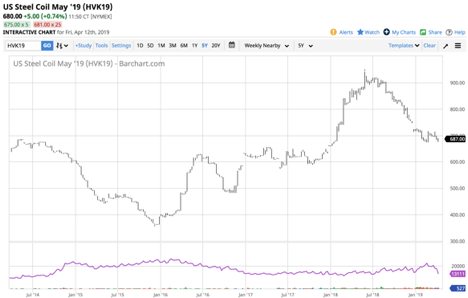 At the same time, the VanEck Steel Index (SLX) has moved higher with the price of iron ore since 2016, while the price of U.S. Steel (NYSE:X) stock has been under pressure recently. 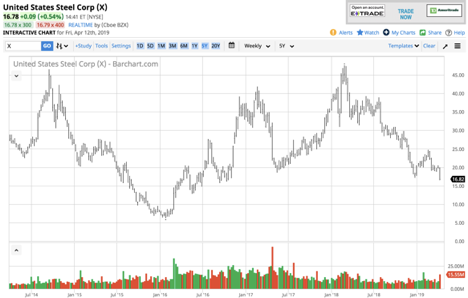 However, at $16.78 per share, X shares are 2.73 times higher than at their bottom in early 2016 that took the price of U.S. Steel shares to a low at $6.15. Meanwhile, the SLX ETF reached a low at $15.30 in early 2016 and was at $40.71 on April 12, 2.66 times higher. On a percentage basis, the SLX product has slightly underperformed the price appreciation in U.S. Steel, but the recent price action in 2019 has been more supportive of SLX than X shares. When it comes to the performance of iron ore versus steel prices in 2019, the former has moved from $67.43 per ton at the end of 2018 to $93.70 as of April 12 on the May futures contract, an increase of 39%. The price of May U.S. Steel Coil futures has moved from $710 at the end of 2018 to $680 on April 12, a decline of 4.2%. Iron ore and steel prices have diverged since the end of 2018. Iron ore is the commodity that is the primary ingredient in pig iron which then refined into steel. Ninety-eight percent of the mined iron ore goes to making steel. Steel is mainly an alloy of iron and carbon. Steel's high tensile strength and low cost make it a market component when it comes to building infrastructure around the world. Builds, tools, ships, automobiles, machines, appliances, and weapons all contain steel. The leading iron ore producers in the world are Australia, Brazil, and China. Like many other industrial commodities, the price of iron ore hit bottom in late 2015 and early 2016. Recently, the price of the primary ingredient in steel has moved to the highest price since 2014. As the price chart of the benchmark iron ore price from NYMEX highlights, the price fell to a low at $38.03 in mid-December 2015. The price has made higher lows and higher highs with the latest peak coming on April 12 at over $93.70. The price chart displays a spike to the upside earlier this year that occurred when the tailings dam at one of Vale's (VALE) iron ore mines in the southeastern Brazilian state of Minas Gerais burst on January 25. The dam collapse killed hundreds of people in the town of Brumadinho, Brazil. 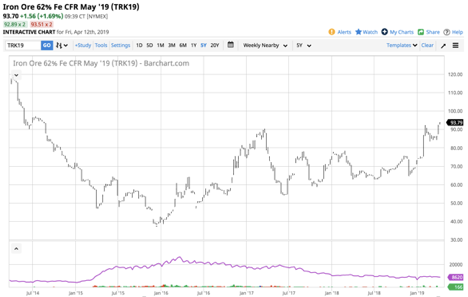 When it comes to the iron ore market, the event caused supply concerns that sent the price of the primary ingredient in pig iron appreciably higher. Iron ore was trading at around $73 at the end of 2018, and the price moved around 27% higher since the disaster. On April 10, the Brazilian government said it would file criminal charges against VALE because of their responsibility for the disaster that caused the loss of life. While iron ore is flying high, the price of steel has not gone along for the ride on the upside recently. However, like iron ore, steel hit bottom in late 2015 and has appreciated along with the prices of many other industrial commodities. As the chart of U.S. Steel Coil shows, the price fell to a low at $364 in December 2015 and was at the $674 level on April 11. However, the steel coil closed 2018 at $710 on the May contract and has moved lower so far in 2019 despite the rally in the price of iron ore which is weighing on those companies that produce the industrial commodity. The price of the input in the steel production process has moved higher, while the price of the output, steel, declined. Moreover, higher oil prices in 2019, since the late December 2018 low, have added another element of cost to producing steel which eats away at the earnings of steel producers. One of the primary issues weighing on the price of steel is the economic slowdown in China. China is the demand side of the equation when it comes to commodities like steel which is a building block for infrastructure. China is the world's most populous nation with the second largest GDP. The trade dispute between the Chinese and the United States has weighed more heavily on China's economy as tariffs, and retaliatory measures caused growth to recede in the Asian nation. The economic decline in China has weighed on demand for steel. Meanwhile, the latest news from the negotiations that would end the era of protectionism have been optimistic, but the price of steel likely needs to see more meat on the bone when it comes to an agreement between the US and China. A new framework for trade would likely give a boost to economic growth in China which could translate into more demand for steel and a host of other industrial commodities. 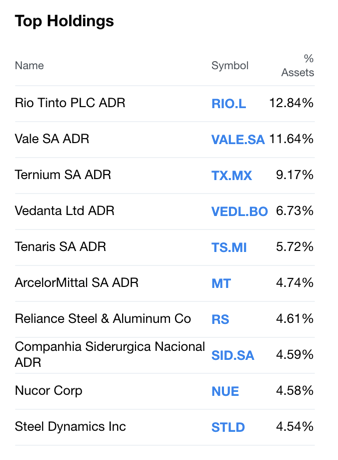 While the ETF holds a significant 11.64% position in VALE shares which is the company under pressure from the Brazilian government over the dam tragedy, it does not hold a substantial position in U.S. Steel. 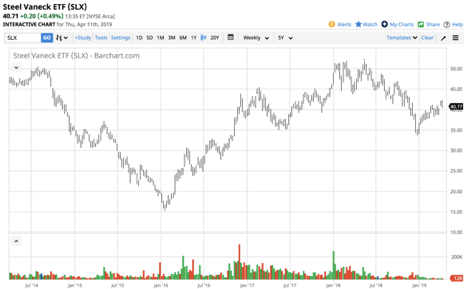 The chart shows that SLX closed 2018 at $34.84 per share and was trading at the $40.77 level on April 12, an increase of 17% so far in 2019. When it comes to U.S. Steel, the shares that traded to a high at $47.64 in February 2018 closed last year at $18.24 per share. On April 12, X shares were trading at $16.78, down 8% on the back of the most recent downgrades by Wall Street analysts. U.S. Steel is not the company it used to be when it was a symbol of US dominance in the industrial world. However, the price action in the stock over recent sessions could be overdone on the downside. When sentiment in a stock becomes so bearish, it is often a great time to pick up bargains. At $40.77 SLX is 166% above its early 2016 low at $15.30 per share. Meanwhile, X shares have done slightly better since the 2016 bottom when the shares traded to a low at $6.15 as at $16.78; they are 173% higher. A trade deal with China could lift the prices of both SLX and X shares over the coming weeks and months. U.S. Steel stock has been a falling knife since the February 2018 high. A call option on X shares could be a limited risk approach when it comes to buying the dip and taking a contrarian view of this company. I have found that going against the prevailing sentiment with limited risk has resulted in some of the most significant profits over my career. When you purchase a call option, the risk is limited to the premium. U.S. Steel could offer brave investors and traders an opportunity at its current price level. The Hecht Commodity Report is one of the most comprehensive commodities reports available today from the #2 ranked author in both commodities and precious metals. My weekly report covers the market movements of 20 different commodities and provides bullish, bearish and neutral calls; directional trading recommendations, and actionable ideas for traders. I just reworked the report to make it very actionable! Additional disclosure: The author always has positions in commodities markets in futures, options, ETF/ETN products, and commodity equities. These long and short positions tend to change on an intraday basis.